The World Society for Protection of Animals (WSPA) is an international organization in more than 100 countries with a network of more than 400 member societies. WSPA has representatives at United Nations, Council of Europe and works in co-operation with the World Health Organization and the Federation of European Companion Animal Veterinary Associations. 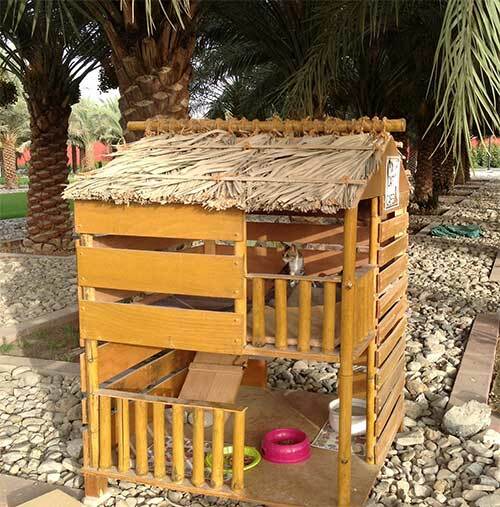 Pet Respect is a department of WSPA and is working with resorts worldwide to provide designated feeding areas for stray cats – Cat Cafés. The cat café concept was originally developed by WSPA to humanely address the problem of feral cat population gathering around tourist resorts. It has proven to be successful in a number of countries around the world including Dubai! Studies have shown that simply removing the cats is ineffective and as long as there are food and water sources and shaded places to hide other cats will take the place of the ones removed. If instead, a stable colony of sterilized and medically attended cats is allowed to stay on the premises, this will prevent newcomers from moving in and will also keep rodents at bay. A) Trapping the cats for spay/neuter. Sterilization is indicated by an ear cut on the cat’s left ear- this is an internationally recognized symbol. B) Vaccination which is normally done at the same time as the neutering or can be done at any point of time. D) Consistent feeding of the cats at scheduled times at the cat café only. The cats will learn to come to the cat café for food and water instead of becoming a nuisance to members and guests of the hotel. Humanely solving the cat overpopulation problem. Reducing health risks to employees and guests. Positively involving employees and guests. Sets the establishment as a local leader in proactive and humane overpopulation solutions for stray animals.